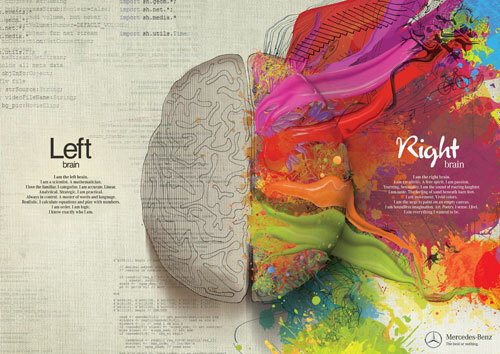 Writing a post on the left and right brain has been brewing within me for a while. More particularly, I’ve been gathering speed for an impassioned holler for equal respect for the right brain as well as the value of integration between BOTH sides of the brain – taking a decidedly HOLISTIC approach. 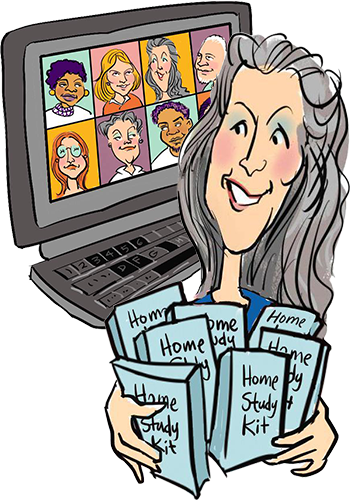 I am a Process Worker and use many rational and linear approaches and also many energetic and emotional methods with the groups and individuals I work with. 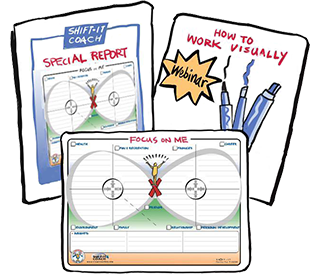 I’m a long time Visual Practitioner having integrated visuals into my facilitation and coaching practice in various ways for 20 years now. 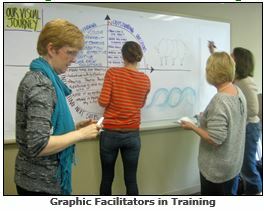 I’m also an instructor/mentor who has the privilege of introducing visual skills to Process Professionals, Creatives and other interested people (see Fundamentals of Interactive-Visuals). 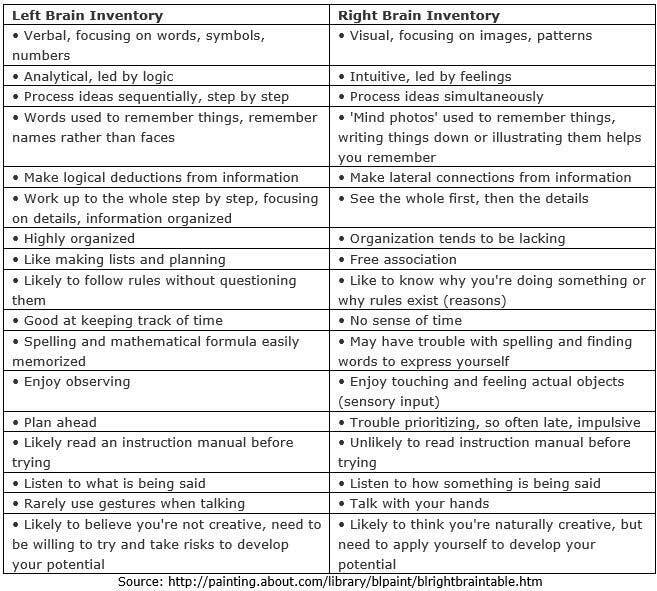 Given these roles I see common reactions over and over again to the inclusion of right brain approaches. And, those who don’t recognize right brain value at all (are decidedly biased to the left brain). Understandably, given the nature of who I am I don’t have a lot of interaction with the last group beyond the occasional hostile comment. So this article is primarily written for the middle group (to help fill in their knowledge or confidence) and to the first (to bring the right in balance with with the left where needed). 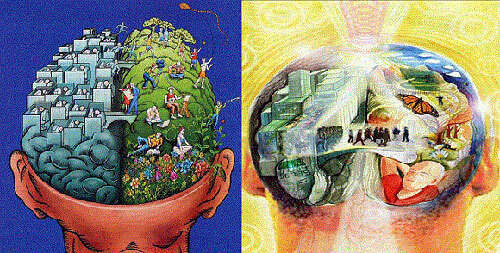 As human beings we are a fascinating combination of what are commonly referred to a left and right brain processes. 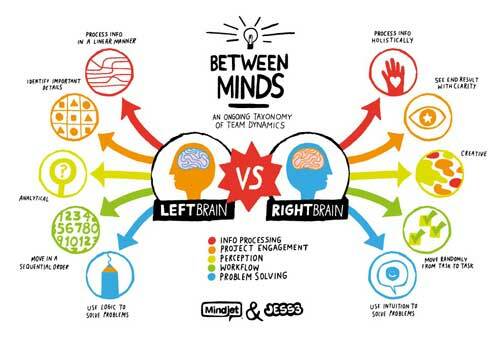 There are so many beautifully done creations on the web depicting the left and right brain functions — as well as the holistic picture of them being married to each other. I really LOVE this one (from a Mercedes ad of all places … which actually makes a commercial point about the awareness, appreciation and market for products and services that marry both). I personally think/feel that BOTH are needed and both are EQUALLY VALUABLE. So much so that I have built my professional life around the inclusion of both left AND right principles. That it behooves us to have both sides equally represented in our global, societal, regional, organizational, family and individual levels in order to be balanced, well functioning and to make healthy decisions. And, through experience, I also believe that for those of us who are Process Professionals, it’s powerful to use BOTH approaches in the rooms we work in – to use a liberal mix according to what serves the groups we are with. In some rooms, this mix of methods is received without a passing glance and with a “but of course there is color, images and movement happening here, that’s just how we do things here” response. In other rooms the color, image and movement of the right brain will provoke a “hey, what’s this … this is different, this isn’t our typical meeting (thank goodness), I wonder what’s going to happen here? !” response. And, sadly, in some rooms (if you manage to get yourself into them in the first place) the inclusion of right brain aspects evokes a “what the heck, who let this flake in” response. However, I have found that even in the majority of these more left-brain oriented environments, if you can hang with the initial reactionary approach (i.e. don’t get defensive) and if you truly know your creativity chops, the initial reactionary calms drastically down after you prove the efficacy of your methods. I can’t tell you HOW MANY times I’ve had people (even people who seemed really on board with bringing me and my WHOLE BRAIN METHODS into a room) who will whisper to me at our first morning break “I gotta tell you, I was kind of scared about how this would go but this is awesome, everyone seems to be really participating and enjoying this”. I’ve come to see that that is just where we are evolution wise. For some, the whole brain (whole being) approach takes some getting used to. That these methods will in some places be met with initial resistance and skepticism but if you know your stuff, you will win them over by demonstrating good work. Downright hostility, I can assure you, is very, very rare. It’s a fear rather than a common actual reality. Sooooooo, if you are interested in providing effective, holistic approaches too, then my advice is to honour your instinct and continue to learn and apply what you need to. If you are more left-brain, you will need to develop the right side of yourself (or partner with someone who has those qualities). If you are more right-brain, you will need to develop the left side of yourself (or partner with someone who has those qualities). It’s the integration of the right/left (masculine/feminine) that is key. Not the inclusion or value of one over the other. P.S. So many great info graphics available on this subject. This didn’t fit into the body of my article but I’m including it here at the end for an additional resource. For those who work with groups, teams and individuals, here’s a useful visual summery from the folks over at Mindjet (from their infographic series, ”Between Minds: An Ongoing Taxonomy of Team Dynamics.). Gives a quick, useful summary of the attributes of left and right brain thinkers — those folks who are sitting in our rooms!